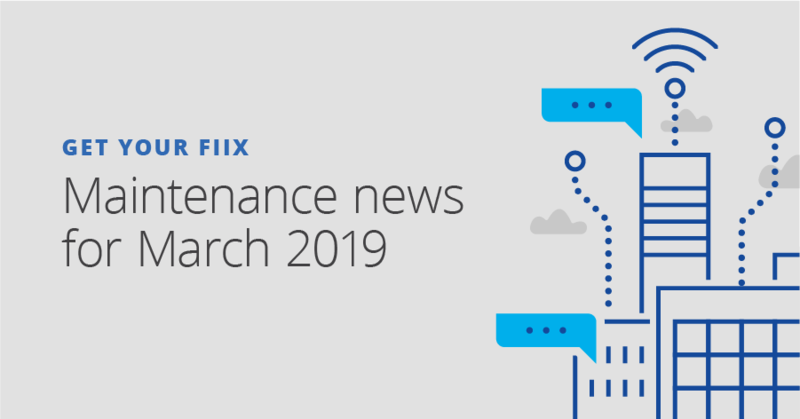 Check out the articles below for your monthly dose of interesting and informative maintenance news from around the industry. Plant Engineering recently released its 2019 Plant Engineering Maintenance Report, which offers a glimpse into where the maintenance industry is today and where it’s headed. One of the biggest conclusions drawn from the report is that maintenance systems and strategies continue to slowly transition to a digital process, with a greater emphasis on technology to manage assets. However, it also points to aging equipment as a threat to modern maintenance, classifying the issue as a race against time. This article explores the benefits of investing in maintenance to reduce energy use. It challenges the misconception that maintenance is always a cost centre by highlighting its potential value. The piece looks at some common areas in a facility where effective maintenance management can help an organization increase return on investment. The author crunches the numbers and finds that a bigger focus on preventive maintenance can stop heat loss and air leaks, bolstering an organization’s bottom line significantly. There is a lot of hype around IIoT, predictive maintenance, and smart machines these days. While the potential for these tools is obvious and exciting, most organizations don’t have the capacity to use them. These facilities are turning to CMMS or EAM software to manage maintenance. The data these systems use comes from human interaction 95% of the time. That’s why this article investigates the relationship between human error and reliability, and how to manage people so you can maximize maintenance software. It isn’t rare to come across a maintenance operation with a promising past that has fallen on hard times. Finding the reason for this regression is never easy. No one seems to understand how the change happened, but they often realize that it took place. This article pinpoints some common reasons why maintenance teams may fall back into a reactive maintenance rut after a while and how they can dig themselves out of a hole. When taken to the next level, troubleshooting can ditch the trial-and-error moniker and become a more efficient endeavour. When troubleshooting is done correctly, your whole maintenance operation can overcome the issues that plague it, like backlog, lost production, and compliance issues. This article takes a deep dive into troubleshooting, why it matters in maintenance, and how your team can fine-tune its approach, including strategies for building better asset histories and task lists. Maintenance issues are often caused by a string of technical issues and process failures. This is why the 5 whys method exists and is used to identify a cause-and-effect failure path as part of a larger root cause analysis. This post takes a look at the 5 whys method, how it’s connected to root cause analysis, and how it can help maintenance teams get to the bottom of a facility’s biggest asset issues by developing long-term solutions. What exactly is reliability, and why is it important to understand the difference between it and other maintenance-related concepts? This article searches for a definition, explains how reliability and availability are different, traces the evolution of reliability, and describes how to use reliability-centred maintenance as part of a holistic approach to asset management. When all is said and done, this piece will help maintenance teams better understand reliability and how to use the concept to stay out of the dark. Choosing the right CMMS could mean the difference between getting your maintenance under control and wasting a lot of time and money. That’s why it’s crucial to choose a CMMS that’s a good fit for your operation. There are lots of options out there, so it can be easy to feel lost or overwhelmed. But fear not! This piece outlines everything you need to know about choosing a CMMS, with tips, scoring templates, and more to help you make the right choice.